I wrote this two-part series for the Dallas Morning News. It was published on Nov. 5-6, 1999. CIUDAD JUAREZ, Mexico – Erik has youthful good looks and a quick smile. Just the kind of guy people trust. Which is why the tall, clean-cut 16-year-old was so good at his job – smuggling drugs. By his count, he raked in thousands of dollars and moved about 20 loads of drugs before Mexican police stopped him at a highway checkpoint in May and found 61 pounds of marijuana in his car. Lucrative, too. And it’s that fast, easy money that is luring more and more kids, Mexican and American, into the multibillion-dollar drug trade. Arrests of traffickers under age 18 are expected to climb to 512 this year, up 58 percent nationwide since 1997, U.S. Customs Service agents say. Most of those arrested and convicted were given probation, not jail time, prompting others to take the risk. For some teens, drug smuggling has suddenly become a way to get not only money, but also a quick thrill. Seasoned law enforcement officials are stunned by the trend. “Some of these kids are as young as 9. It’s very upsetting,” said U.S. Customs Service Commissioner Raymond Kelly. Stopping kid couriers along the Southwest border is especially difficult, agents say. More than 250 million people and about 90 million cars and trucks cross every year. Now throw in some fresh-faced kids – honor students and high school athletes among them – whohave pot stowed in their car trunk or backpack. “It becomes increasingly difficult for our people to sort out the few people who are carrying drugs from the vast majority who are not,” Mr. Kelly said. The lure of smuggling is especially strong in Mexico, where wages are low. “Some of these 16- and 17-year-olds work for peanuts at the assembly plants, getting $45 a week. So when a smuggler comes and offers $200 or $300 for a day’s work, it doesn’t take a lot of math to figure out these kids are going to go for it,” said Rogelio Soto, chief of the Val Verde County Juvenile Probation Department in Del Rio, Texas. No matter how tempting the money, young smugglers are often exploited and abused by adults who see them as throw-aways, police say. Mexican traffickers stuck a red-hot wire into the soles of one 15-year-old boy’s feet because he lost a drug load, El Paso authorities said. In Juarez, officers allegedly sexually molested an 18-year-old and stole 24 pounds of the marijuana she was carrying, the teenager said from jail. “These kids know very little about the drug business. They’re a small link in a very big chain,” said El Paso sheriff’s Lt. Marvin Ryals, assistant commander of an anti-drug task force. His office has that modern, post- Miami Vice look: Bulletproof vests hang in a neat row a few feet away from electronic surveillance equipment. And there’s the “Hall of Shame,” featuring anti-drug souvenirs: Rugrat stickers peeled off packages of cocaine, seized silk shirts decorated with little AK-47 assault rifles and marijuana leaves, and a confiscated Polaroid that one proud 19-year-old smuggler took of his Dalmatian next to a load of mota, or weed. Not all is fun and games. 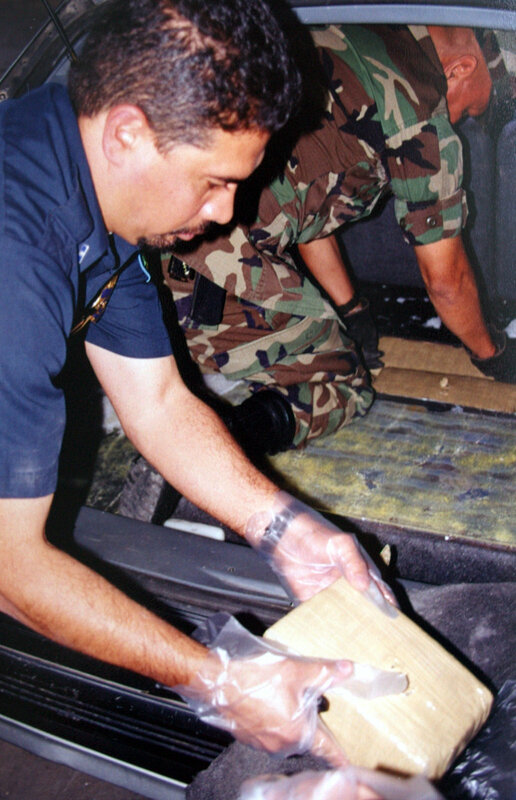 From June 1998 to May, task-force agents arrested 123 juvenile smugglers and seized from them nearly 6 tons of marijuana and 279 pounds of cocaine with a street value of $9.2 million. A drug load can change hands a dozen times as smugglers move it from interior Mexico to El Paso and beyond, he said. Most kid couriers are pawns, bit players in a cast of thousands. Those running the show are the crime bosses who run Mexico’s major smuggling organizations, including the Arellano-Felix, Amezcua-Contreras, Caro-Quintero and Carrillo-Fuentes gangs, U.S. agents say. The Carrillo-Fuentes family is thought to control much of the trafficking through the Juarez-El Paso corridor even though its leader, Amado Carrillo, died in 1997, the agents say. Just the other afternoon, customs agents in El Paso captured two girls, 15 and 16, with 170 pounds of marijuana. Customs Inspector Daniel Gamboa said that the teenage driver seemed nonchalant while crossing but that the veins in her neck were bulging. So he had Buck, a Belgian shepherd, take another sniff of her car. When confronted, the girls cried. Take the strange case of a Mexican girl, 16, who was stopped in Laredo in July. Customs agents say 711 pounds of cocaine, worth $32 million, was piled in plain view in the back of her pickup truck. She was quickly arrested. Few would have guessed that a 9-year-old boy going through Miami International Airport last summer had 2 pounds of heroin worth $125,000. Customs found it in his Nintendo game and in three pairs of shoes. Agents say that the boy, a U.S. citizen, had flown in alone from Cali, Colombia, that he knew he was carrying drugs and that he probably had smuggled before. But he was released because of his age and sent back to Colombia. U.S. anti-drug agents say recruiters search for prospective smugglers at schools, discos, malls, factories, even burrito stands. One 16-year-old U.S. citizen – her identity is withheld because of her age – said a friendly couple in their 30s approached her and a 17-year-old friend in Juarez. Eager to go on a shopping spree, the girls jumped at the chance to earn a few hundred dollars. But as she drove her mother’s van across the border at El Paso, customs agents stopped her and found 62 pounds of pot behind the dashboard. Her mother, a teacher’s aide, was devastated by the arrest of her daughter, who was popular at school and ran track. “It’s like they put a dagger in your heart,” the mother said, crying. The two sat next to each other in an El Paso probation office, where they had agreed to talk. The girl tugged at her long, black hair. Suddenly tears came to her eyes, and for a moment she couldn’t speak. Under house arrest, she wears an electronic monitoring device around her ankle and says she feels like an animal tagged for study. She leaves home only to go to school, work at a pizza parlor and check in with probation authorities. Her mother said she changed her phone number out of fear that traffickers would track down the family and avenge the lost drug load. Some parents force their own children to smuggle drugs, agents say. 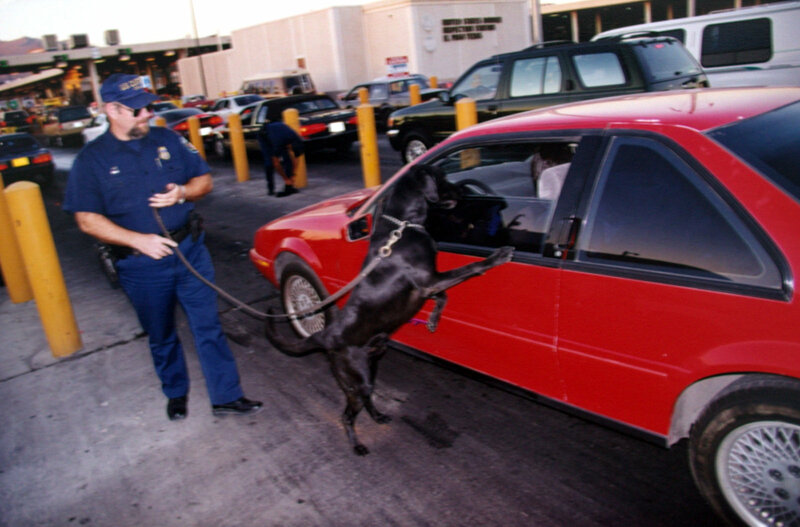 On Oct. 19, a customs dog named Tag in Nogales, Ariz., took sudden interest in a particular car. 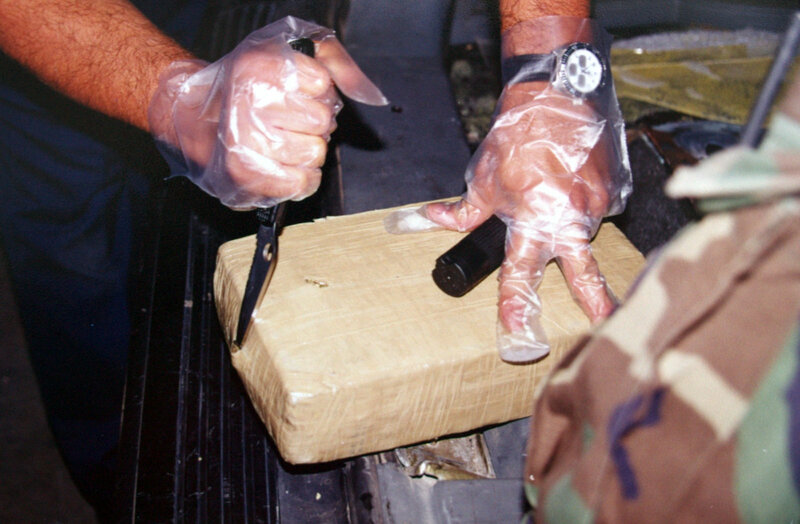 No drugs could be seen, so agents let it cross the border. The car, driven by a boy, 16, stopped a few blocks away, and his mother, 46, sister, 14, and her friend, 15, climbed inside. Agents later stopped and searched the car. The three females had 4.8 pounds of heroin worth $300,000 hidden in their underwear. El Paso and Laredo are hot spots for kid couriers, but they also turn up at airports. Customs agents say 72 young people between the ages of 10 and 19 were arrested while hauling cocaine or heroin between July 1998 and June. * A smuggling ring in New York City recruited 18- to 20-year-old Hasidic Jews to bring in the designer drug Ecstasy from Europe. The pay: free plane tickets and $1,500 for each successful venture. Federal prosecutors in July charged Simcha Roth, 18, of Monsey, N.Y., Shimon Levita, 18, of the Netherlands, and five others with importing more than 1 million Ecstasy tablets. The suspects evidently thought the couriers’ “young age, black hats, dark suits and side curls would not arouse suspicion,” said an Aug. 9 customs report. * In April, smugglers in Jamaica dressed a 13-year-old girl and her 11-year-old cousin in their Sunday best, stowed 7 pounds of cocaine in their luggage and sent the girls to Miami. Agents found the drugs in two shampoo bottles. * In September 1998, a 13-year-old boy at New York’s John F. Kennedy Airport admitted swallowing 90 latex-encased heroin pellets weighing 2 pounds. In a similar case in April, a 17-year-old flew into Miami from Venezuela with 3.4 pounds of cocaine – two pounds in a garment bag, the rest in his belly. Teen traffickers give a variety of reasons for doing it. She’s now serving a 10-year sentence in a Juarez jail. An El Paso girl, 17, said she smuggled for the money and the thrills. She said a guy named Freddy, about 20 years old, recruited her at a Juarez disco blocks from the border and asked her to move 10 pounds of pot across the border. Then 16, she was caught in El Paso with what turned out to be 42 pounds of marijuana, sent to a detention center and never saw her $500 fee. Houston-born Ruby Carmona was living in a quiet Mexican village of 1,500 when a neighbor offered her $3,000 to smuggle a drug load. Then 18, she said she had just bought a car and needed the money. “He told me, “Don’t worry. If they catch you, they’ll let you go.’ So I said, “OK,’ ” she said. 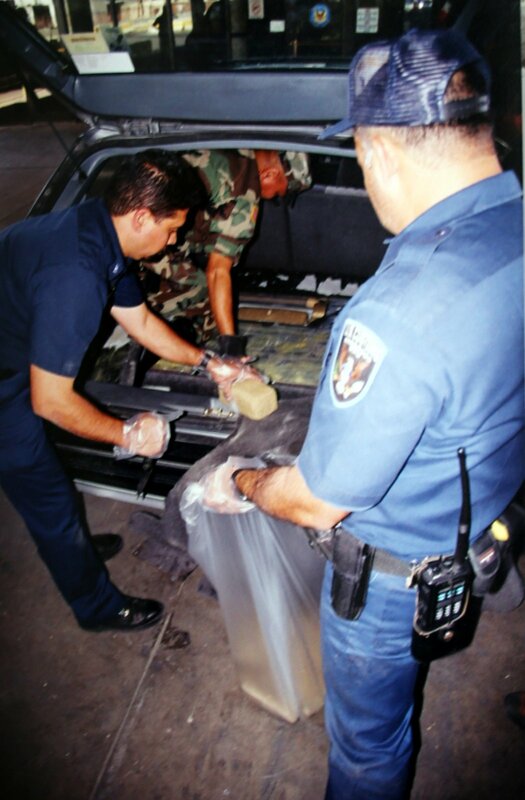 Agents caught her at a checkpoint southwest of Juarez in March 1998 and pulled 55 pounds of dope from her car’s gas tank. Frantic, she later called the neighbor for help. “He said, “I don’t know you,’ and hung up. These people use you, betray you,” Miss Carmona said. Now serving a 10-year sentence in a Juarez jail, she believes she was expendable all along – a decoy for a bigger drug load that breezed through the checkpoint while agents arrested her. “I had plans. I was going to go to Denver and finish school. Well, this is my Denver,” the 20-year-old said wistfully as iron doors around her clanked. Not all teenagers are so remorseful. But he says he’s convinced that won’t happen again. After he leaves juvenile detention in six months, he said, he’ll finish school and become a Mexican anti-drug agent. That way, he said with a wink, he’ll get rich off drug bribes and use his badge to stay out of jail. “It’s cool over there,” he said of Mexico’s federal attorney general’s office. 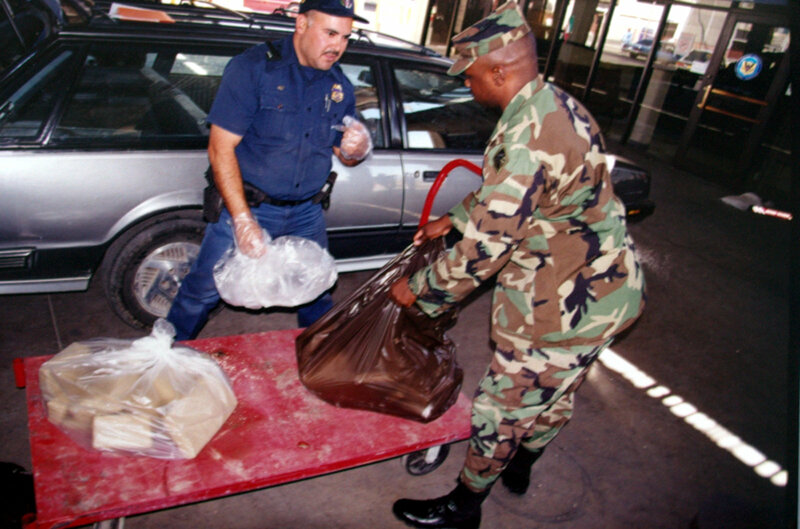 The agency has been plagued with corruption over the years, and some officers have actually been caught guarding or transporting drug loads. In 1997, the agency’s top anti-drug official, Gen. Jesus Gutierrez Rebollo, was found living in a powerful drug lord’s luxury apartment and charged with taking payoffs. Erik said he’s not worried about anything bad happening. EL PASO – The sudden rise in teenage drug smugglers along the Southwest border has stirred a debate over how to punish those who are caught. As it is, most get probation, not exactly a tough statement against illegal drugs, some critics say. “If it were up to me, I’d revamp the system to make it less attractive for juveniles to get involved with drug smugglers,” said Rogelio Soto, chief of the Val Verde County Juvenile Probation Department in Del Rio. Indeed, something seems awry when kids who smuggle 50-pound loads of marijuana are let go. Yet jail and adult sentences often do juveniles more harm than good, youth advocates and others say. “You can’t just lock up a kid. And you can’t treat all of them exactly the same. It’s all case by case,” said Dave Contreras, a prosecutor in the El Paso County attorney’s office. The challenge is separating the wide-eyed, innocent, remorseful kids from the hard-core offenders who have no desire to change their ways. Jorge, 16, falls into the latter category. He grew up poor in the rugged Mexican state of Michoacan but figured out one thing quick – marijuana means money. So he became a smuggler. Police first caught him moving a load of pot when he was 11 years old and locked him up for eight days, he said. Jorge kept at it, grew his own field of marijuana and made enough money to buy a house and a pickup truck – all without doing serious jail time. “If you’re not afraid and you have heart, everything comes out OK,” he said. At the other end of the spectrum are kids like Rafael, also 16. Just a few weeks ago, he said, a childhood friend took him to meet some strangers, who asked him to drive some drugs across the border for $300. He said he needed money to fix his car’s broken window, so he agreed. Customs agents in El Paso stopped him and found 161 pounds of marijuana. He was sent to a juvenile jail and said he feels terrible for letting down his family, all Jehovah’s Witnesses. Like Rafael, many young smugglers are first-time offenders. Mr. Contreras recalled the case of a 15-year-old El Paso girl, a member of the National Honor Society. One day last year, she told her mother she was going to Juarez to buy Christmas decorations. Instead, she picked up “about 100 pounds of grass” and tried unsuccessfully to sneak it across the border. For her and others who “do something stupid and it’s a first offense,” jail isn’t the answer, Mr. Contreras said. The girl finished probation early, completed community service and quickly got her life back together. Smuggling organizations target El Paso because it is one of the busiest of the Southwest border’s 39 crossing points. About 70 percent of the teen traffickers arrested there are boys. Apprehended juveniles who are U.S. citizens have outnumbered Mexicans 154 to 81 in El Paso since 1997. Mexicans arrested in Texas are most likely to be returned to their country to serve probation, saving the state an estimated $100,000 a year, officials say. Probation officer Rosa Maria Aguirre said 28 of the 29 juveniles she currently supervises in Juarez were caught smuggling drugs. “Many are students, and for them $100 is a lot of money. Just imagine how they react when someone offers them $700,” she said. Teens found guilty of a felony drug offense in Texas must serve a minimum of one year in jail. Hard-core offenders 14 and older can be tried as adults and get up to 40 years in prison, though such cases are unusual. Of the 235 teen traffickers arrested from January 1997 to April 1999 in El Paso County, 98 received probation and 63 others had their cases dropped or dismissed. Only 17 were sent to juvenile detention. The rest of the cases were either pending, combined with other cases or otherwise disposed of, county statistics show. Minors arrested in Mexico often serve a year in juvenile detention. Most return to their homes and rarely get into trouble again, said Cristina Ramos, a supervisor at a Juarez teen jail. Adriana, 16, from the Mexican state of Sinaloa, said she smuggled out of sheer desperation. Her father had died at 61, after which her mother and eight brothers and sisters no longer had a source of income. A friend offered her a quick 6,000 pesos – about $650. All she had to do was take a 46-pound bag of marijuana from Sinaloa, on the Pacific coast, to Juarez. Mexican police caught her at a highway checkpoint. Others begin planning their next smuggling operation even before leaving jail. Meantime, the river of drugs continues flowing northward. American anti-drug agents say 55 percent of the cocaine, half the marijuana and 20 percent of the heroin consumed in the United States is thought to come across the Southwest border. No one knows exactly how much is brought across by young smugglers, but agents doubt that it could be more than 15 percent of the several hundred tons of drugs that make it in every year. Many large-scale traffickers hide their illicit cargo in tractor-trailers, ships and freight containers, agents say. Agents say the number of juvenile trafficking arrests nationwide rose from 325 in 1997 to 449 last year, but it remains a rare offense. Only 3,045 – or 2.9 percent – of those in juvenile jails in 1997 nationwide were traffickers or drug dealers, the Department of Justice said. Murderers were only slightly less common, at 1.8 percent. Most incerated juveniles were in for theft, robbery, assault and parole or probation violations. In Texas, fewer than 2 percent of youths sent to juvenile detention centers are classified as “controlled-substance dealers,” which includes both traffickers and street dealers, statistics show. Still, U.S. agents expect the number of arrests to continue to rise. During one night along the southern frontier in El Paso, veteran Border Patrol Supervisor John Hubert was short 11 agents and had just 24 men and women to watch nine miles of border. Some traffickers sneak across the border, then make their way north through the 125-year-old labyrinth of storm drains and sewers that crisscrosses El Paso. Others play the odds, driving across and hoping customs agents won’t catch them. Many teens see little wrong with smuggling drugs, especially marijuana, said Ms. Perez of the El Paso County Juvenile Probation Department. Expecting law enforcement to come up with a miracle solution isn’t realistic, said J.J. Lopez, chief Customs inspector in El Paso. Teachers, parents, police – all of society must get involved, he said.